In a recent study, Framingham Foot study concluded that foot problems can be the major cause of back problems in women. They believe the gait, or the way a woman walks, causes the body to twist and the foot to pronate. This leads to foot and lower back problems for many women. The study found that women were more effected then men, probably due to the differences in gait between genders. 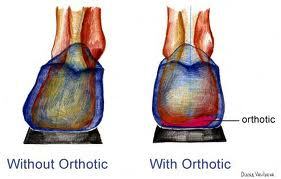 The study showed that the use of orthotics can be used for prevention and treatment of these problems. Orthotics, namely custom orthotics will regulate the movement of the foot and ankle while a person walks. They help to correct biomechanical issues with the foot and ankle. While, prefabricated orthotics can help in ways, a custom orthotic is molded to the shape of an individual's feet, which will significantly impact the gait. If you are having pain in your back, take a look lower. Your feet may be the cause of your problems. Our office will be able to evaluate your gait (the way you walk) and determine if you are a candidate for custom orthotics. Make your appointment today!